Sir Nils Olav has come a long way since he was adopted by the Edinburgh Zoo. After being knighted in 2008, the king penguin and official mascot of the Norwegian King’s Guard has been promoted to the position of Brigadier, BBC reports. The title was bestowed upon him by His Majesty the King of Norway’s Guard at a special ceremony attended by more than 50 uniformed soldiers. To mark his new duties as inspecting officer, Brigadier Sir Nils Olav strutted past the troop of this year’s Royal Edinburgh Military Tattoo. The zoo staff reportedly noticed an aura of importance around the bird that matches his highly decorated status. Barbara Smith, Acting Chief Executive Officer for the Royal Zoological Society of Scotland, said in a press release, "It is a very proud moment and represents the close collaboration between our two countries, Scotland and Norway." 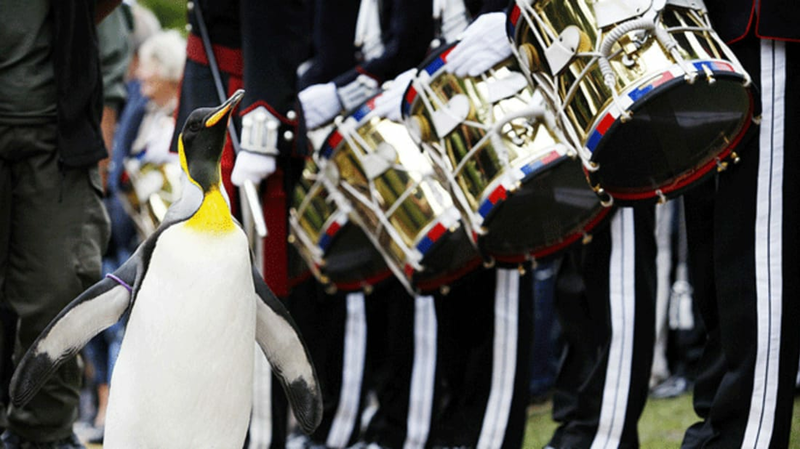 Sir Nils Olav is the latest in a line of Edinburgh Zoo penguins who have served as mascots to the King of Norway’s Guard. The zoo’s first king penguin was gifted to them by a Norwegian family in celebration of their opening in 1913. It’s since become tradition for the Royal Norwegian Guard to visit the zoo when passing through the Scottish capital. The zoo’s current king penguin is their third Nils Olav, a name that originated with Norwegian Guard lieutenant Nils Egelien and Norway’s King Olav V.